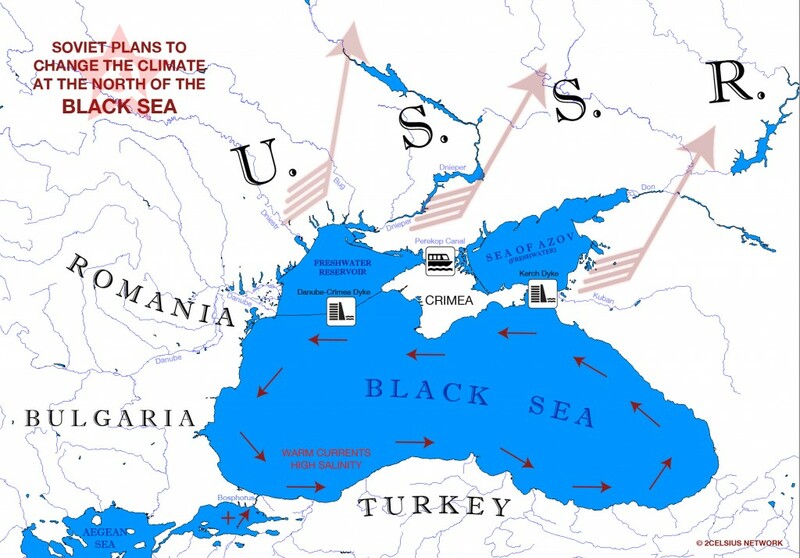 Following the grand Geo-engineering ideas expressed by Soviet scientists such as Igor Adabashev, Arkadiaei Markin, and most of all, Petr Mikhailovich Borisov, the communist game and obsession with climate did not spare the Black Sea. It has been imagined the erection of a super-dyke that would have linked the Danube Delta (where the large European river flows into the Black Sea) and the Crimean Peninsula. Furthermore, the “constructive geography” continued with the cut of the Perekop Isthmus that connects Crimea to the Ukrainian mainland and finally dam the strait of Kerch. The incredible result would have consisted in the fact that all freshwater brought by the big rivers Danube, Dniester, Dnieper, Don, and Kuban could have been retained in the Black Sea’s North West and in the Sea of Azov. Thus the Sivash lagoon, also known as the Rotten Sea, would have been flooded with freshwater and desalinized whilst the whole dammed area would have become a giant reservoir of freshwater. Consequently, the soviets would have prevailed in the fight against droughts in Moldova, Ukraine and in the South of Russia. And that’s not all there is; water deficits in the largest part of the Black Sea would be compensated by the warm waters of the Mediterranean via a current through the Bosphorus, hereby resulting quite a consistent warming of the Sea and consequently of the climate. “It will be nice and warm in communism,” writes Lucian Boia ironically. “Such projects were not merely innocent parties of the overwrought Soviet engineers. They were soberly analyzed in research institutes and many specialists had given their favorable approval,” adds Boia. Maritime dams and dykes coupled with a giant network of canals from Europe to Siberia appeared as a virtual necessity given that many lakes in inner USSR had increasingly dropping levels in the 1960s and ‘70s. The Lake Aral disaster is nowadays a hideous testimony to the extent of communist ignorance of any ecological principle. The level of the Caspian Sea was also dropping, at least partly due to the use of water from the rivers (mainly the Volga), which supply it, for irrigation. Total inflow from the rivers into the Caspian Sea over the years 1946-1965 has been estimated as 900 cubic km less than it should have been. At the time of the collapse of the Soviet Union, the Caspian receded with “only” 39,000 square km – from a total surface of 430,000 sq. km. Furthermore, at the levels of 1971, “the salt content of the Sea of Azov, which is described as the most productive fishing basin in the world, is also likely to increase as water from the Black Sea flows in, to make up the losses which the rivers Don and Kuban suffer from industry and irrigation. In addition, the water table is falling over a wide region covering all these areas.” It was therefore a reason in plus for the Soviet Geo-engineering intelligentsia to dyke (at least) the Sea of Azov. What consequences had existed in case such damming would have taken place in the area of the Black Sea? An analogy with the Sea of Aral would not be too far fetched. “The Sea of Aral offers the image of a disaster at its purest,” Boia notes. In the decades between 1960 and early 1990s, it lost more than 40% of its surface (26,000 sq. km from 65,000 sq. km). This issue might have affected only the dammed part of the Black Sea and the Sea of Azov, however a high increase in salinity would have doomed the soil of countries ashore, such as Romania or Bulgaria, to everlasting infertility. Carried by the wind, salt is being dispersed and re-deposed inland with millions of tons each year. Abadashev initially proposed the covering of the polar ice cap with a thick layer of fertile soil and artificially create brand new tundra. On top of that he advocated huge pumps able to move entire seas and lakes, literally a global heating system – as to benefit all five continents, while mountain ranges and rivers he treated like pieces on a Lego board. His work that culminated with Global Engineering in 1966 is mere fantasy, however, at the time, it was treated with the utmost seriousness by soviet academics and authorities. Markin was a huge fan of nuclear power that he wanted to use to instantly cut canyons through mountains, canals between rivers and new reservoirs. He believed that the warm waters of the Pacific could be diverted into the Arctic through the Bering Straits with the help of massive pumps activated by the atomic energy of a 3 million kW nuclear plant. Obviously, nuclear radiation was not of immediate concern for the revolutionary scientist. P.M. Borisov proposed to dam the Bering Straits to divert Atlantic waters into the Pacific and melt the Arctic sea ice due to a warm stream that would have crept under the arctic ice cap. Boia, Lucian, La mythologie scientifique du communisme, Editura Humanitas, Bucharest, 2011, Author’s Romanian translation (Mitologia științifică a comunismului), p. 201. Adabashev, Igor, Global Engineering. Progress Publishers, Moscow, 1966, p.101. Lamb, H. H., 1971. Climate-engineering Schemes to Meet a Climatic Emergency. Earth-Sci. Rev., 7: 87-95, p. 89.